I’m not the Western type of gal. 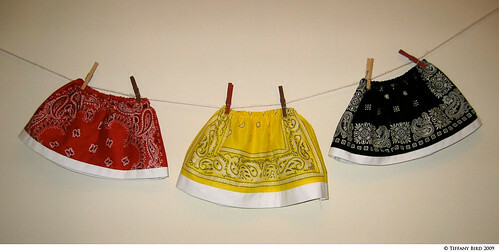 So I wasn’t sure about making bandana skirts since the only thing I have used bandanas for was to blindfold in games. I thought I would give it a try since I found bandanas for 50 cents each. I think they turned out pretty cute and not too Western-ish. I used a white bed sheet from the thrift store as the trims. The only thing I forgot to do was prewash the bandanas. Oh well, they still turned out fine after I washed it. Kaye loves the yellow one and wears it all the time. If you made something inspired by Simply Modern Mom, please upload pictures of it in our Flickr group to show it off to everyone. You may be featured on Simply Modern Mom. P.S. I got the idea from Vanessa’s blog. She has the cutest stuff. LOVE these, very stylish looking! I am going to make some of these for my granddaughter! Thanks! !